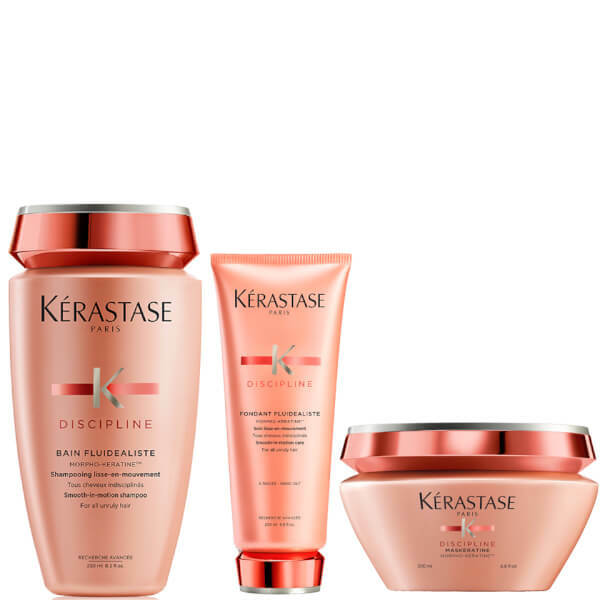 Keep frizz under control with the Kérastase Discipline Shampoo, Conditioner and Hair Mask. Specifically developed with advanced smoothing agents, the trio target the root cause of unruliness, including humidity and brittle ends, to ensure a sleek, polished finished with long-lasting results. Smooth, strengthen and add resilience to your hair with Discipline Bain Fluidealiste, which protects your hair against frizz and humidity for up to 72 hours. Formulated with Amino Acids, a Wheat Protein derivative and Ceramide R, the shampoo will cleanse and strengthen your hair, whilst the Pro-Keratin formula will restore the integrity of the hair. Creating an even surface area, it'll leave your hair with a soft texture and a frizz-free finish. Discipline Fondant Fluidealiste will leave your hair feeling soft and supple, whilst helping to protect against frizz and humidity for up to 72 hours. Boasting a Pro-Keratin formula, the conditioner will restore and re-establish the integrity of the hair, whilst a blend of Amino Acids, a Wheat Protein derivative and Ceramide R will create an even surface layer and produce a frizz-free finish. The hair mask is a rich and luxurious treatment that will provide your hair with intensive conditioning and nourishment, whilst protecting against humidity and frizz. Boasting a pro-keratin formula, it helps to repair your hair from the inside out to produce tresses that are more manageable. Frizz will be reduced and your hair will have increased fluidity. Conditioner: Apply to wet hair after shampooing. Leave in for 1-2 minutes. Rinse thoroughly. Mask: Apply to washed, towel-dried hair. Massage into the hair from roots to ends. Leave in for 3-5 minutes. Rinse.